Use water, not vegetable broth. 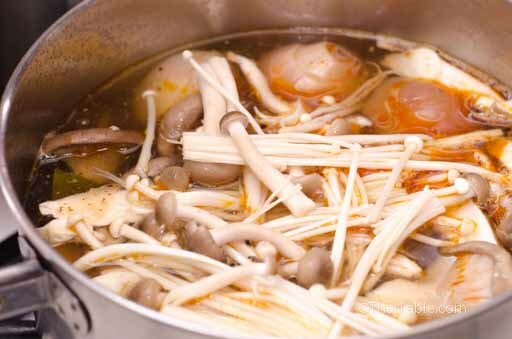 The broth should have mushroom flavor, not other veggies. 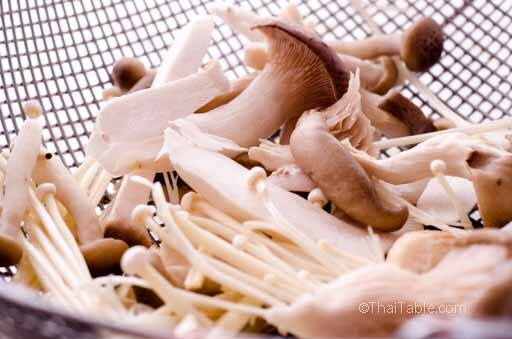 Use any assorted mushrooms that have mild flavor and soft texture. I would not recommend using shitake because of their strong flavor or earwood because of their texture. Galangal: You may need more or less galangal depending on how mature the root is. If you get a mature root, the flavor is stronger and vice versa. Use the amounts of salt, vegetarian chili paste and lime juice as a guide. You may like it hotter and more sour than my taste. Use red chili peppers, not green, so that eaters can easily pick them out if they want. Your broth will be influenced by the vegetarian chili paste. You may need to adjust seasonings. With some dishes, I would recommend to follow the recipe closely, but not for this soup. 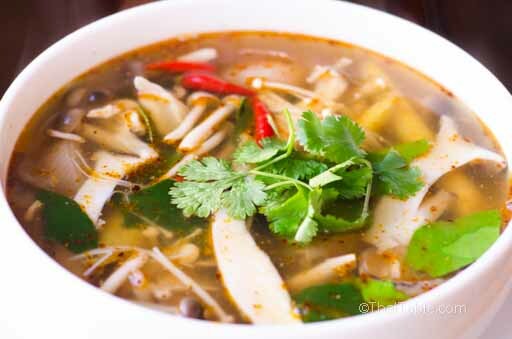 In general Tom Yum dishes are very flexible and can be followed loosely. 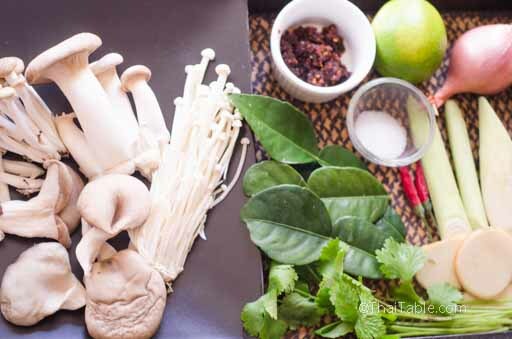 Adding a larger quantity of spices, lemongrass, shallots, galangal, will not hurt the dish. The most important thing is to make this dish to your personal likings. 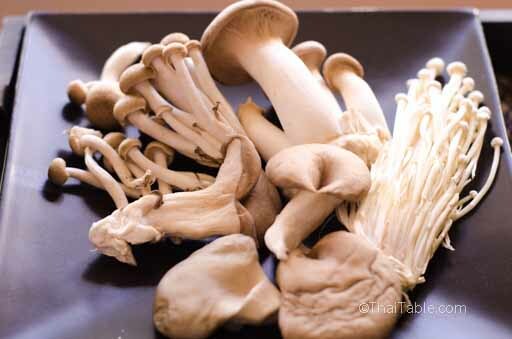 The mushrooms that I use for this recipes are enoki, shemeji, king trumpet (king oyster) and oyster mushrooms (picture 2). These are available at most Japanese and Asian markets. You can use some or all of the mushrooms. Cut away the bottom of the enoki and shemiji mushrooms to clean away the dirt and the tough to chew parts. Break up the mushrooms into smaller pieces. Slice the king oysters lengthwise into thin pieces, about ¼ of an inch. 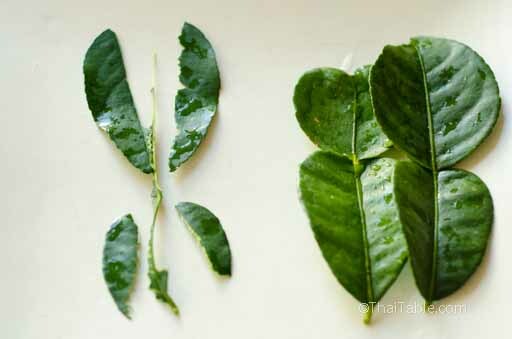 Peel away the kaffir lime leaf from the center stem (picture 3). Toss out the stem. Chop cilantro leaves into 1 inch pieces. Slice lemongrass into 4-inch piece to fit into the pot. The traditional method is to bruise the lemongrass first with a pestle or a heavy knife then break it into large piece and tie it together with its leaves. Now, if instead of plucking some lemongrass out from the backyard, you get it at a market you probably don't get the leaves. If you grow them yourself, use the leaves, too. Peel and cut shallots in half. The shallots in Thailand are much smaller than shallots available in the US. You can either cut or bruise the shallots. Slice galangal into thin pieces about 1/3 of an inch. Use a total of 1 - 2 inches. When galangal is difficult to slice, that indicates that is more fibrous and mature. It should then also have stronger flavor. Add 5 cups of water to a 2-quart pot. 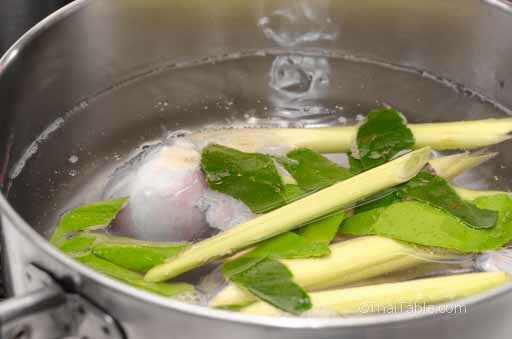 Add lemongrass, shallots, galangal and kaffir lime leaves to the pot and let boil for 10 minutes so that the lemongrass, galangal, shallots and kaffir lime leaves can release their flavors. After the soup has been boiling for 10 minutes, add 1 ½ teaspoon of salt and a tablespoon of vegetarian chili paste. Add mushrooms by dropping larger pieces in first and follow with smaller ones (picture 6). Let the soup boil again and turn off the heat. Do not cook the mushrooms too long, they will shrink and turn chewy. Squeeze the juice from a lime. I got almost 4 tablespoon from this lime. Cut the chili peppers lengthwise or leave them whole if you like your tom yum mild. In a serving bowl, pour the lime juice about 3-4 tablespoons (picture 7). 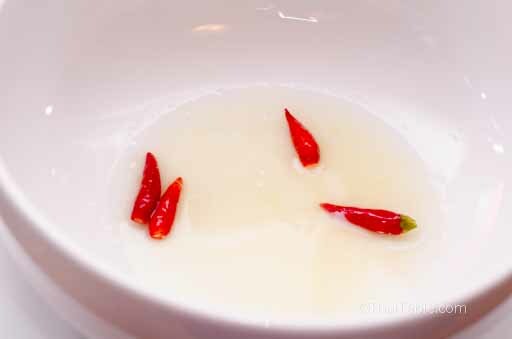 Pour the soup into the serving bowl that has lime juice and chili peppers. Garnish with cilantro leaves and serve hot with rice.